Things have been so crazy and hectic, yet wonderfully productive the last two weeks. My new collective the Bloody Swans recently launched our website at Bloodyswans.com. 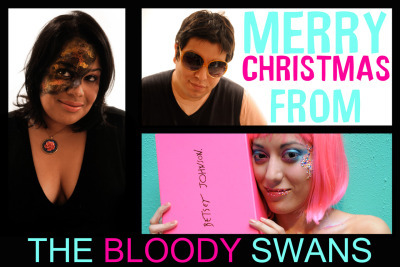 It’s a collaborative photo/make up art project with Mariela and our best homegirl Carina. We’re in the process of editing and preparing our photos but you can see a few raw photos on the site. I also put together this video of Carina with my vast sunglasses collection using warm-up photos we shot during our first session. Speaking of Carina, she and I made this video Christmas card secretly behind Mariela’s back on Wednesday. Like a lot of my recent work it takes inspiration for Jim Mendiola’s video for Girl in a Coma’s Static Mind. Merry Christmas! Lastly, I’ve been doing some work with Mission Loc@l. Here’s this rcent video featuring myself and the lovely Amanda Martinez reporting on the Mexican Museum’s Christmas Traditions of Mexico exhibit.